In the list you can see there are 2 version of T3: basic by Tilson and my with correct smoothing factor(see on the picture). As you see my T3 is something middle between LSMA and ILRS. newdigital, Nodp53, Gus4x and 6 others like this. Thanks a lot. 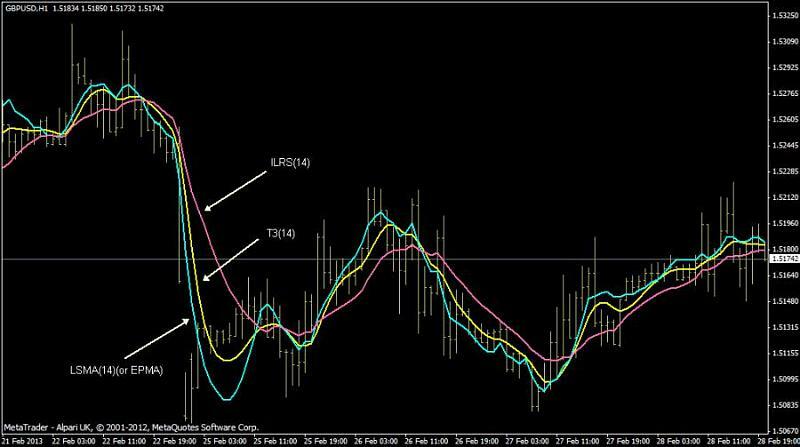 This is indicator as a trading system coded on the way as all-in-one. It may be good to create simple EA for MT4 and MT5 based on those differences "between" ... just to test or optimize the settings with MT5 strategy tester and use it for trading or next improvement for MT4 for example. compile indicator in MetaEditor or restart Metatrader. open chart, right mouse click on the chart, select Template and our template (by name). And everything will be loaded. PS. New template file (allaverages_3_newmt4.tpl) for new build 600+ indicators using is attached. For more information - read first post of the thread. Alex-162, vishal gandhi and HDHORDA4 like this. Why you don't add on your All averages :the half of channel price (Donchian channel,Kijun,Tekan) ??? Sorry, but it's another story because there are so many (periodic, fractal, volatility and so on) channels and I prefer to research them separately. Important: AllAverages for MT5 was uploaded to the 1st post. Do you think it's possible to add the SSA of price in a NON repaint version based on this indy ?